The loss of muscle mass with age (sarcopenia) is associated with a decline in muscle strength, muscle power, muscle quality, and physical function and increases in fat infiltration and mortality. I love jumping. Been doing it as long as I can remember. Jumped long jump, high jump and triple jump when I was young. Played basketball, and preferred jumping for rebounds. Did martial arts and preferred jump kicks. Now I’ve quit all organized exercise and generally just jump around. Oh, and landing is also great. But jumping is more than childish fun for me. When I worked as an exercise instructor for older people, most all of them told me that the ability that was most quickly reduced with aging, and one of the things they missed the most, was the explosiveness – the spring in their feet. But they also told me that they just stopped moving in this way as they got older. Not because jumping became more difficult in any way, but because they just did. Truth be told, you rarely see older people jumping. They usually prefer less explosive ways of moving, and I really think that is sad. An important part of our health as we age is the ability to be self-sufficient and good physical function is paramount to our quality of life. Both strength training and power training are effective at increasing physical performance in older adults , although power training may yield similar results with less total work performed per training session . Power training has also been found to be superior to regular strength training in older adults . Even moderate plyometric training improves chair-rise performance in older adults  and all in all it seems that we should keep jumping as we age. It really matters. As we age our muscles atrophy. We lose muscle cells and the reason seems to be that we lose motor neurons: the neurons that signal the muscles to move. Our body has no interest in having a lot of energy demanding muscle tissue hanging around if it’s not being used. Less signal to move means less muscle tissue. 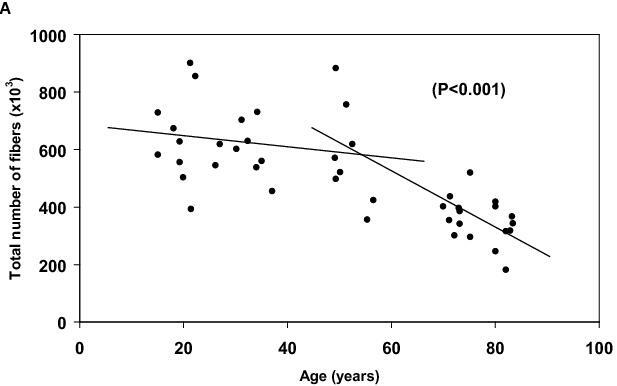 This first graph from Faulkner et al  show the relationship between the total number of fibres in the vastus lateralis muscles and the age of men between 18 to 82 years of age. 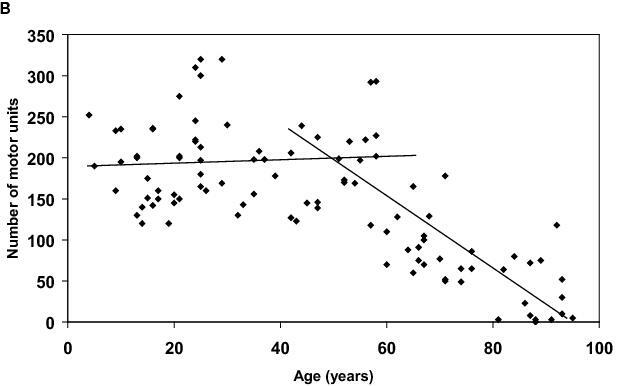 The second graph shows the relationship between the number of motor units in the extensor digitorum brevis muscles (muscle in the foot that extends a couple of toes) and the age of men between 5 and 88 years of age. Why we lose these motor neurons is not well understood. Some people will say that aging in itself is the cause, but the reason for believing this seem simply to be that older people have less motor neurons, as does other animals as they age. Exercise will slow this process, but by how much we cannot say. We really do not know how much off the neuron loss is caused by aging and how much is caused by inactivity or lack of challenge to skeletal muscles. Still, exercise helps, and particularly explosive exercise. For most elderly people, the decrease in muscle mass is accompanied by at least an equal, but usually even greater, decrease in strength and power, as well as an increase in muscle weakness (the strength per unit of cross-sectional area of muscle) and fatigability. The sum total of these effects is that age-related changes in the musculoskeletal system have a significant impact on the everyday activities of the elderly. It is also usually said that aging causes a preferential degradation of fast muscle fibers and this is has always made sense, given how old people actually move less explosively. New research however, indicate that there might also be quite a large loss of slow muscle fibers . An important difference between regular resistance exercise and plyometric (high velocity strength) exercise is that while resistance exercise promotes more muscle hypertrophy, plyometric will more so improve neuron-muscle cooperation, increase strength per unit of cross-sectional area and also a preferential stimulation of fast twitch type II fibers. Plyometrics will improve the ability to generate a lot of power in a short time. Consider the high jumper. The force generated to fling a 2 meter high man over a 2.4 meter obstacle is massive, and yet the high jumpers are not known for their large leg muscles. An incredible amount of force can be generated even by normal sized muscles. This video shows Swedish high jumper and Olympic gold medalist, Stefan Holm jumping over some hurdles (He is 1.81m tall and his personal best indoor is 2.40m.) I wonder how he will move when he is 60. An important benefit of resistance exercise is prevention of osteoporosis, and all sorts of high power exercises are particularly effective at building bone mass. But we should remember that the main problem with osteoporosis is falling. If we don’t fall or injure ourselves, it does not matter much if our bones are a bit brittle. So we also need to focus on preventing falling and this is where speed may be important and where plyometrics could be more important than resistance exercise. Now, I wasn’t joking about also liking landing. Landing is in itself a perfectly fine exercise. Remember that landing is great eccentric exercise. For obvious reasons we are stronger landing than we are jumping. This is good; as it will prevent us from jumping so high that the body cannot take the force of the landing. Further, it means that if you want to exercise using landing, you need to either go higher than you can jump, find some extra weights or land on one foot. I use landing as an exercise form and often do several jumps per session down from hights that will really challenge my leg muscles. I think the take home message here is this: we don’t have to become week; we don’t have to lose the spring in our steps. We don’t have to stop jumping if we don’t want to. What we need to do in order to live long independent lives is simply to keep moving and keep jumping. 1. Faulkner JA, Larkin LM, Claflin DR, Brooks SV: Age-related changes in the structure and function of skeletal muscles. Clin Exp Pharmacol Physiol 2007, 34: 1091-1096. 2. Hanson ED, Srivatsan SR, Agrawal S, Menon KS, Delmonico MJ, Wang MQ et al. : Effects of strength training on physical function: influence of power, strength, and body composition. J Strength Cond Res 2009, 23: 2627-2637. 3. Ferrucci L, de Cabo R, Knuth ND, Studenski S: Of Greek heroes, wiggling worms, mighty mice, and old body builders. J Gerontol A Biol Sci Med Sci 2012, 67: 13-16. 4. Jones TE, Stephenson KW, King JG, Knight KR, Marshall TL, Scott WB: Sarcopenia–mechanisms and treatments. J Geriatr Phys Ther 2009, 32: 83-89. 5. Drey M, Zech A, Freiberger E, Bertsch T, Uter W, Sieber CC et al. : Effects of Strength Training versus Power Training on Physical Performance in Prefrail Community-Dwelling Older Adults. Gerontology 2011. 6. Henwood TR, Riek S, Taaffe DR: Strength versus muscle power-specific resistance training in community-dwelling older adults. J Gerontol A Biol Sci Med Sci 2008, 63: 83-91. 7. Miszko TA, Cress ME, Slade JM, Covey CJ, Agrawal SK, Doerr CE: Effect of strength and power training on physical function in community-dwelling older adults. J Gerontol A Biol Sci Med Sci 2003, 58: 171-175. 8. Saez SD, V, Requena B, Arampatzi F, Salonikidis K: Effect of plyometric training on chair-rise, jumping and sprinting performance in three age groups of women. J Sports Med Phys Fitness 2010, 50: 166-173. 9. Purves-Smith FM, Solbak NM, Rowan SL, Hepple RT: Severe atrophy of slow myofibers in aging muscle is concealed by myosin heavy chain co-expression. Exp Gerontol 2012. Damn you for reminding me I need to get back into doing some box jumps. But box jumping is such great fun motivation comes naturally. Thanks, I'm going to start adding plyometrics to my routines. I am th 70 year old in your previous post. I enjoyed rebounding in basketball also. Going to cut n paste some of those references. Thanks again. Ha, speak for yourself. I do quick jumps on/off the mini-trampoline we have and that wears me out pretty fast, not to mention requiring a decent amount of coordination. The graphs are all over the place. There are some 70 and 50 year olds that have the same number of muscle fibres as some twenty-something year olds! This is pretty normal with these biological variables. The correlation coefficient is significant and shows a clear trend. If we consider the human body as efficient, metabolically and mechanically, I have to question whether plyometrics actually preferentially recruit the type II fibers. The more you train, the more efficient you become, meaning the less type II fibers you need to recruit. I love jumping but the last time I tried to incorporate jumping rope into my exercise routine I dislodged crystals in my ear that keeps us balanced and ended up in the hospital. It took 3 days to get my equilibrium back and treatment was the Epley maneuver to recover. I've recently taken up Zumba dancing and love it…however, my body just doesn't have the bounce it used to have..
That is of course part of the problem; we stop jumping as we age and lose the bounce we once had. But bounce can come back although we should probably incorporate it gradually into our routine. I get what your saying. It was meant to mean that training will reduce the loss of «springiness» although I am fully aware that springiness will be lost. It is not a case of either – or, but of how much. Forrige Forrige innlegg: Hva er egentlig lavkarbo?